RARE IS THE DAY THAT THERE IS NOT AT LEAST ONE ARTICLE PUBLISHED TALKING about the necessity of ensuring your computer, phone, and other electronic devices and communications are protected so as to keep your data and identity safe. With good reason, of course, since data breaches and identity theft are real threats in our inner-connected world. Back in March, though, appears a story that takes the idea of protecting your phone and turns it on its head. It seems, according to this article from Time, that when a gentleman in Nimbin, Australia, stepped outside to take a video of someone he knew who had a bow and arrow. 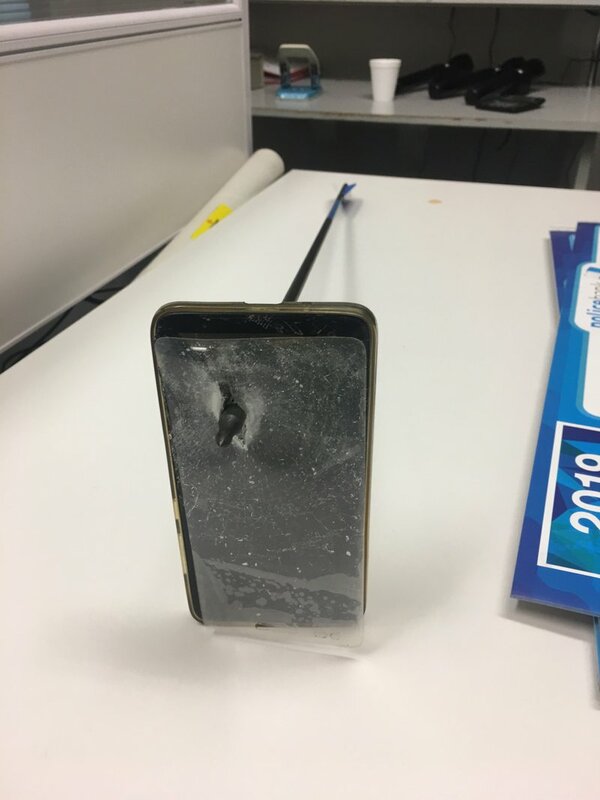 Allegedly, the story continues, the man fired an arrow at the one holding the phone, and the phone saved him from being seriously injured. Reading about this incident brought to mind a reminder of our calling as Christians to be open to the reality we worship a God who challenges us to be open to divine work in ways that might not be anticipated, but that are life-transforming and even life saving. I don't know of any who have bought a cell phone thinking it would protect them from a vicious bow-and-arrow attack, and yet it went above and beyond what anyone could have expected and wound up saving someone from grave injury or death. Maybe on this Wednesday afternoon in the midst of Lent, we can take a moment to remember the words found in Hebrews 11 - "Now faith is the assurance of things hoped for, the conviction of things unseen." Just because we can't see or imagine something doesn't mean it won't happen. In other words, let's realize from an arrow-pierced cell phone that while anything can happen, God is always with us, and the most unexpected thing to happen in the history of the world, the miracle of Easter Sunday, bears witness to this reality. 49 YEARS TO UNLOCK AN IPAD?? ?